Tyler Parsons. The Calgary Flames top prospect according to NHL.com. 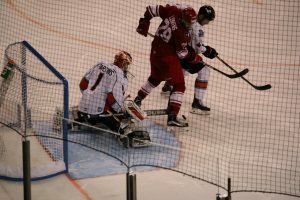 A young goalie with noticeable talent and vast potential, made what might be his last appearance for the Kansas City Mavericks on Tuesday night. And a good note it was. The Mavericks played the league leading Colorado Eagles that dominated with a 31-7 record going into that game. Parsons didn’t give them a chance to look all that special and only gave up 1 goal in 24 shots. Tyler had a mindset going into that game and he stuck to it. He has a strong mental complex and it carries over to the rest of the team. He is able to recover quick and recover strong. Having that edge of a conditioned players mind helps him see the game from all angles. His understanding of the game goes beyond the crease and therefore he is able to further appreciate the efforts his teammates put out to have his back. He is an impact player and really motivated his team to be better and play to their highest potential. Coach John-Scott Dickson raved about his performances in his short return and even did not place the blame on him for last Friday’s loss. He credits that to four deflection goals and some bad hops. Parsons came back to play only having two games under his belt in the less month or so. After battling an injury then when returning, being immediately sent to Stockton. Coach Dickson went on to say. Tyler Parsons came back for 3 more games with the Mavs as an opportunity to see some more action and get some shots live. The crowd roared on Friday night hearing his name announced in the starting lineup. He made a name for himself down here and amazed all in attendance with his abilities. Kansas City did what it needed him to do if he heads to California a confident and polished goaltender. Mason McDonald will take the reins once again for the weekend alongside Chris Nell and that could very well be the way the rest of the year goes for the Mavericks. The Eddie Lack trade and the success of David Rittich opened a position in Stockton that Tyler Parsons has earned and will likely retain for the near future. It will be fun to follow the 20 year old goalie and hopefully see him wear the Flaming C one day. Parsons numbers to date with the Mavericks are a record of 11-9, 22 games played, 595 saves and 60 goals against with a save percentage of 0.908.